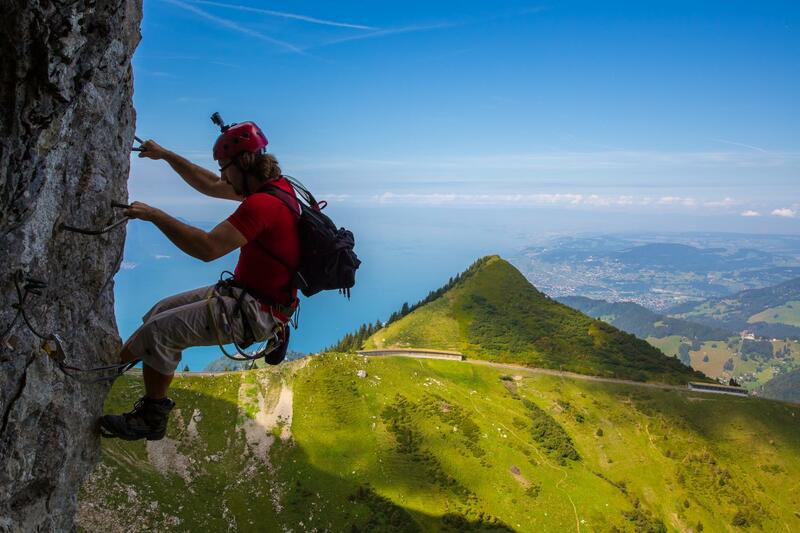 Overlooking the Riviera and Lake Geneva, the Rochers-de-Naye Via Ferrata is a breathtaking experience, in every sense of the word! This demanding route is for seasoned climbers only and their efforts are rewarded by one of the best views in Switzerland! A climbing route with fixings to help you on your way, the Rochers-de-Naye Via Ferrata is for tough climbers. Take the cogwheel train from Montreux (“Jaman” stop) or travel by road through Caux. Equipment can be hired in the sports shops in Vevey and Montreux. The via quickly sets the tone with a vertical spur of about 50 m, followed by a rope bridge, and then a cave where the climbers can rest. The route continues with a narrow slope, then a succession of grass ledges. Here climbers can take the way out; only the fittest continue on to the second very aerial section, open only from 1 July. Once at the top, climbers are rewarded by a magnificent view and can return to Montreux via the cogwheel train or on foot via the mysterious cave trail.